He came to Shanghai to seek fortune, carrying two woven bags of books. He ended up selling pork to Lee Ka-shing, one of the richest men in China, and authoring his own book. Leisure at a wood shed in Shanghai when Lu Chuanjiang first came to Shanghai. Lu Chuanjiang, a native of Dingyuan County in the eastern Chinese province of Anhui, was born in May 1970. He came to Shanghai in the early summer of 1998 to seek fortune, carrying two woven bags of books. Thanks to Shanghai’s reform and opening-up, Lu, who started out working on a pork stand, later ran his own stand, established a food company providing pork to canteens, including that of a company in Shanghai owned by Lee Ka-shing, one of the richest men in China. 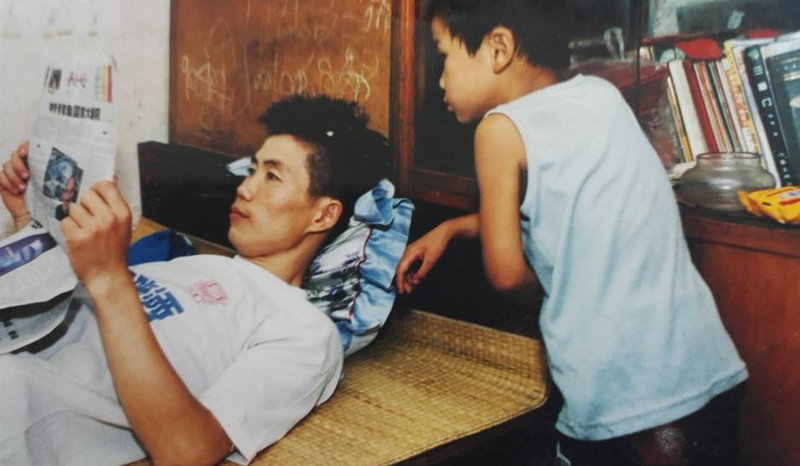 Besides a busy work life, he has also been committed to philanthropy, taking care of eight old people in a senior home who don’t have relatives. He has also been named one of Shanghai's top readers, and has written a book called The Poem in the Distance of a Dingyuan Native, which has entered the catalogs of the National Library of China and Shanghai Library. Lu’s personal story is the epitome of many migrant workers in Shanghai who benefited from the city’s historic reform and opening-up. 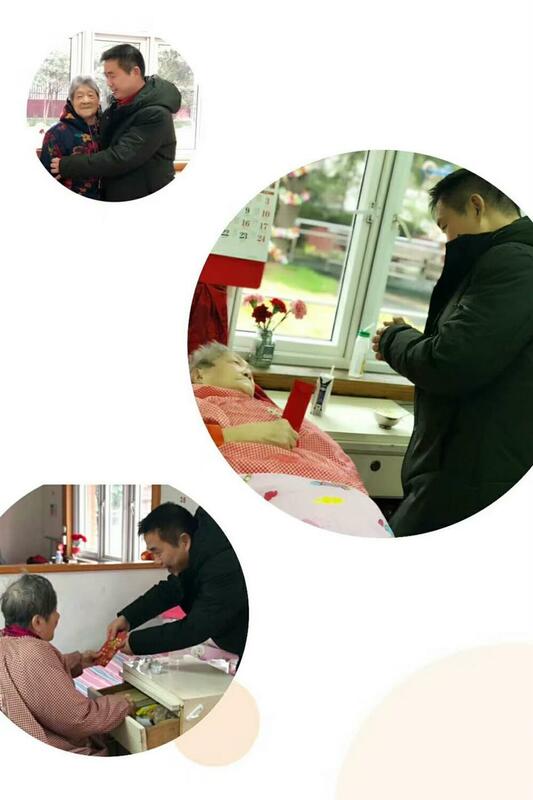 Through Xinmin Evening News, Lu Chuanjiang started to take care of a few old people at a welfare home in 2004, and the good deed has lasted 14 years. I was born in a small village in Dingyuan County, Anhui Province, in 1970. At that time everyone in the family had only a palm of land to farm and one could hardly make ends meet. I decided to seek my fortunes in Shanghai. Back in my hometown, I had experience selling watermelons and vegetables. I started working at a pork stand in Tanziwan, a village-like neighborhood in the central part of the city, after coming to Shanghai. I started to write poems to vent my anxiety because they didn’t understand that I had great expectations for my future. I wasn’t a master in literature, but I learned to write from the two chunky bags of books I brought with me to Shanghai. Just as an old Chinese saying goes, heaven rewards those who are diligent. With experience from working at the pork stand, I opened my own after less than six months and rented an 8-square-meter room for myself. There was only an old bed and an old wooden wash basin in the room, but they were my roots in this city that I earned myself. I learned the hard way that hard work doesn’t necessarily guarantee success. I woke up every morning at 2am and rode a bike to a wholesale factory 10 kilometers away to purchase pork for sale, but customers were few. Every day I had to leave a good amount of pork in my former boss’ freezer so that I was given an ultimatum after only a few days to clear them out, but I didn’t even have the money for a freezer. I was 5,000 yuan (US$730) in the red after less than a month since I started my own business, which was a lot of money at the end of the 1990s. I would have to beg for food if I kept losing this way. To save money, my wife and I ate only noodles, for three meals every day, because noodles can make one feel full without adding anything else. I could throw my troubles to the back of my mind only when I read the biography of Lee Ka-shing, one of the richest men in China, and my favorite novel, The Ordinary World by Lu Yao. My patience in weathering difficulties paid off. Whenever I had time, I would help out at stands which sold better to watch how they worked and gradually learned the ropes. I paid more effort to ensuring the good quality of my pork and offering good service to my customers. Finally, after about six months, I was on par with my competitors. I admired Lee Ka-shing’s wisdom in doing business after reading his biography. I was inspired and decided to include companies as my clients. In the next few years, I delivered pork to canteens of a few companies in Shanghai, including Shanghai Hutchison Pharmaceuticals, a branch company owned by Lee Ka-shing, and established a food company. I was able to proudly announce to people that I sold pork to Lee Ka-shing! From a neighborhood pork stand, a stand in a food court and a grocery market, to an eight-square-meter pork shop with freezers and a car for delivery, my business has evolved with the reform and opening-up of the city as well as my whole life and dream. Over the years I have witnessed the transformation of the city’s transportation and environment, getting up early in the morning and making deliveries all over the city. Many rules and standards developed in the meantime have become examples to other cities across China. Living in a metropolis with culture like Shanghai also keeps me learning as a migrant worker. When I was a little boy, I was especially fond of picture books, and I still remember that I exchanged half a bun for my first book with a man who sold books from a bamboo basket. There were not even any bookstores at that time in my hometown. In Shanghai I can now relish books whenever and wherever I want to — in a library, at a book fair or in a community learning center where anyone can use the computers there to surf the internet. I’m keen to learn about laws and the government’s policies towards migrant workers, and I have also learned to be a philanthropist. In 2004, through Xinmin Evening News, a local news outlet, I started to take care of eight old people living in a welfare home in Changning District who didn't have relatives. Since then I visit them every year during the Spring Festival, our Chinese New Year, and spend some quality time with them. In 2010, I was chosen by the National Trade Union to star in a short film depicting the life of migrant workers in China for the World EXPO that was held in Shanghai that year. The film was played at the International Labor Conference in Geneva. We migrant workers have been given more and more opportunities to showcase ourselves at various cultural events. This year marks the 20th year since I came to Shanghai. This city, with its inclusiveness, became my new home, and three years ago I finally settled here. In my study, I placed the certificates of awards I received in this city, including the “Excellent Young Migrant Worker in Shanghai” and the “Top Amateur Writers in Shanghai” awards. Last year I was awarded an “Excellent Migrant Worker in Shanghai”, and with this award I will be able to become a true Shanghai resident. I have also published my first book, The Poem in the Distance of a Dingyuan Native. These opportunities and honors resulted from the local government’s care and love for migrant workers. To this day I still remember what my father once said to me: that books make a prosperous man. I have benefited from that belief, and I often tell him that Shanghai has a lot to offer if one is willing to contribute his knowledge and effort to it.